Lately, I have visited many dual-sim that I even surprised when the device fall into the hands of one card operator. For all the time spent with the 2-in-1, began to develop a sense that these smartphones are doing for people who uninviting Internet, they look almost nothing from these devices, just use email and only do what they call. I am sure that most owners dvuhsimnyh devices now not recognize yourself. 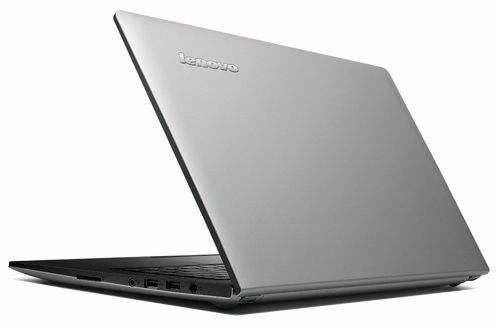 What do you do when the most top-end device in this category can not afford, and need to upgrade? And then it opens a simple glance at the buyer cloud of possible variants, price tags that begin with the sometimes funny numbers. Indeed, often the user does not need all the features HTC One Dual Sim, yes and not worth it so cheap to just have a fancy smartphone. And this is the case the company has prepared a few cheaper options. Relatively recently put on sale new dvuhsimniki line Desire is not marked letters and numbers. 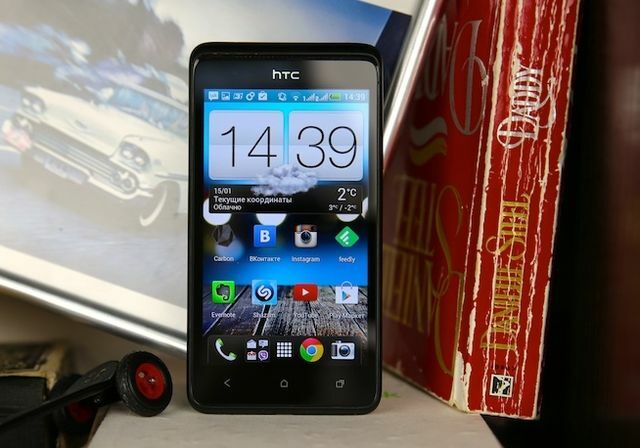 And today we will get acquainted with the HTC Desire 400, midway in the line of new products from HTC dvuhsimnyh end of last year. 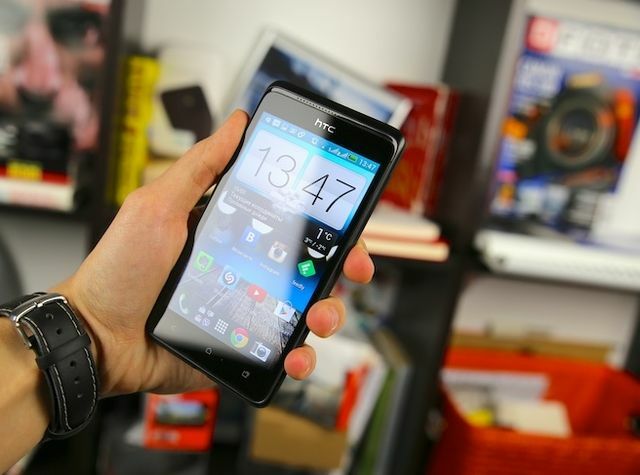 New HTC made so cool now that is not immediately clear, expensive or cheap device. Of those models that fell into my hands, everything felt more expensive than stand in reality. So it is with Desire 400. Cute, slim smartphone. In the style of the latest models of HTC: become more rectangular shape and the slots for the speakers less and less noticeable. By the way, this change really made the look much more enjoyable compared to Desire V and, especially, Desire SV. Flattened side faces make housing visually much thinner than it actually is. Yes, and many other items to create the look of a more expensive device. Taiwanese were able to surprise and interior decoration. And I’m not talking about the processor, although it has also changed (with Qualcomm to ST-Ericsson), and about the color of the lid. When a user buys a new smart phone, the first thing he inserts his card there, then turns on and tunes. Anyway, I do it in that order. 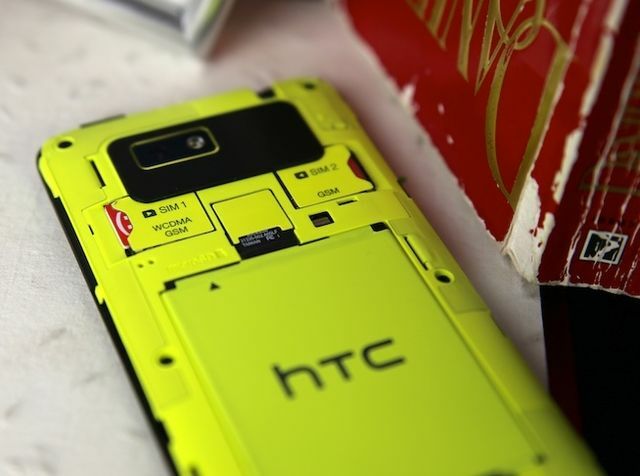 So, open the lid Desire 400, the user sees a steep acid green design, which pulled me smile for the next two days. I do not know why and how it happened. Just a funny little thing then you can show your friends, and they will say, “Ooh, cool!”. Trim if you think about it after such a surprise, standard – the headset, charging cable, charging itself and paper. As mentioned above, the design is really a success. Dimensions devaysa quite comfortable for most users – 131,8 x 66,9 x 9,9 mm and weighs 123 grams. 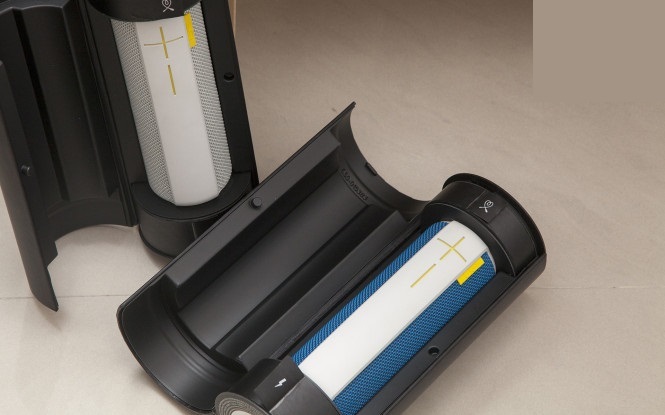 It is quite convenient to use with one hand for quick tasks (such as answering a call, when the second hand is busy with shopping bag), or twist the ribbon social networks. Otherwise, when it comes to answering mails / messages, web browsing, notes, and other things, unwittingly connects the second hand. I think in many ways the most wines these angles. Whether they are smoother, as in previous models, typing would be more convenient. True, it is a question only a couple of days, the discomfort disappears with time, and quite easy to use handheld device. Desire collected 400 4: when you click on the back cover appears creak. Boca also creak. But keeps the back cover just fine. Materials picked up notably. Front glass surrounds the metal frame, the rest of the body and has a removable plastic rear cover. 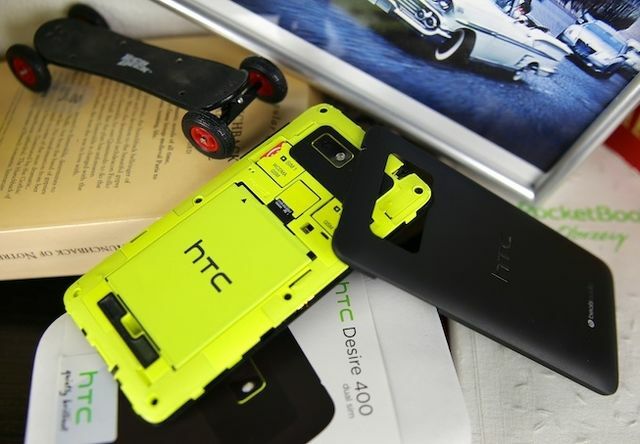 Coverage in the best traditions of HTC – one of the most pleasant soft-touch plastics in the history of mankind. This, of course, a matter of taste, but personally I think this cover most successful in the category. It almost does not leave traces of use, and it is long enough to keep a good appearance, and still cool to the touch. It might not be the most precious creation of Taiwanese, but judging from materials not immediately say how much this smartphone (8 out of 10 people called cost more than this). Something that really want to find fault with – button. No, do not touch with them all ok. Do not like the power button and volume control. They are just a little peek of the case, to find them complicated and awkward to press. Get used to them not immediately released. The exact location of all the working elements – no surprises. Bottom – Micro USB microphone opening on top – headset jack, a notch to remove the rear cover and the power button. Right – only dual volume control button, and the left – nothing much. 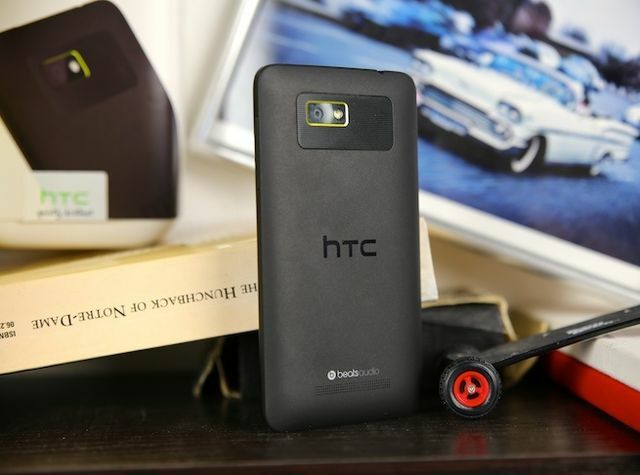 Rear – cool selection box camera with flash, located in a corrugated box, glossy print logo HTC (which looks cool on the matte surface), logo and perforated slot BeatsAudio dynamics. The bulk of the front is reserved for glass. Top – the earpiece from which good enough indicator breaks notifications. Under glass 4.3-inch display. Above him logo HTC, proximity sensors and lighting, and under – three touch buttons: “Back”, “Menu” button and multitasking. They all have a pleasant light. In general, you get used to the ergonomics, but mechanical buttons and squeaks body leave an unpleasant aftertaste. Correct the situation body materials and appearance in general. 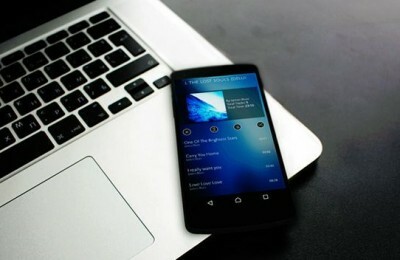 Smartphone looks thin and beautiful. I had a variety of smartphones, and more often, cheap Soup and felt inexpensive. But here’s the latest from HTC, including our current Desire 400, leave a little puzzled, because smartphone looks expensive price tag, and it’s very nice. Especially the final buyer. Judging by the latest reviews, many people perfect size display format 4.1-4.5 inches (second position from our recent survey). HTC Desire 400 just fit in the middle of a gold – 4.3”. Of course, there are many people who are more comfortable other diagonal display, again, a matter of personal preference. Back to Desire 400 – Display is made by technology Super LCD 2. Maximum viewing angles. Picture a warm lamp, although personally I prefer the cold shade. In general, the color quality is not caused trouble. Illumination sufficient for sunny days (I was lucky to catch this one in January! ), And the minimum value you want a little less. This display is very nice work. Resolution 800 x 480 pixels, which is equal to 217 ppi. More than once tore this accordion, and this resolution is enough for comfortable work with your smartphone. I do not know what the cause of discontent, but too often raised this question. 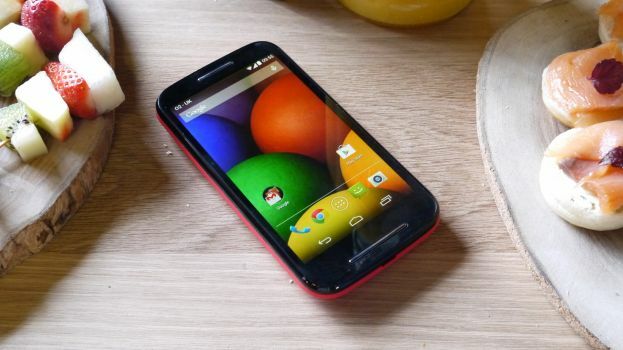 Out of curiosity, I conducted a little experiment – Desire 400 gave several owners Retina-displays, and all respondents were completely satisfied. Yes, and I’m after the iPhone display would not say that I was a bit frustrating the local. So what about the pictures you can not worry. There are not many smartphones that do not have a front camera. It seems that without it already looks old school iron. Yes, HTC Desire 400 only one camera. On the one hand, the paranoid will be a little easier on the other – New Year’s Eve will not make a video and immersive congratulate you dear man. The only camera here – 5 megapixels. It might not be much, but to get a decent picture can still be. As usual for this class of cameras prerequisite is a good picture lighting. And when buying should be noted that the light in standard office space is not to be missed. Pictures will still be a bit noisy and not always clear from the first time. Videos can also be recorded, 1280 x 720 pixels. Problems are the same – not quickly focuses and noisy. If you picture is very important and you do not see a life without quality camera in a smartphone, then, unfortunately, Desire 400 is not for you. Those who are important video calls, too, does not fit this unit. But not all that bad. People who are photographed on a smartphone supersereznoe NOT something (food, cat feet here and please do not consider it important pictures), features this camera will suffice. I think the flagship characteristics dvuhsimnike not demand as many people think. Dvuhsimnikov users often need to just stay in touch, but do not measure FPS in Real Racing 3. But this does not mean that such people should watch minutes as the phone draws some graphic animation. In Desire 400 installed, to put it mildly, quite old dual NovaThor U8500, clocked at 1 GHz, a gig of RAM and video Mali 400 MP. Drive much is not enough, only 4 GB, but there is a slot for memory cards and more applications can be easily transferred to it. In general, working smart is quite acceptable, but switching between applications a tightened. In the game you can kill some time, but only in a not very demanding. In other words, the above RR3 frankly slows, and Cut the Rope is excellent. In Desire 400 lives Android 4.1.1 with a proprietary HTC Sense. Only version of the graphical shell is not the last, and 4 +. There is no BlinkFeed’a. 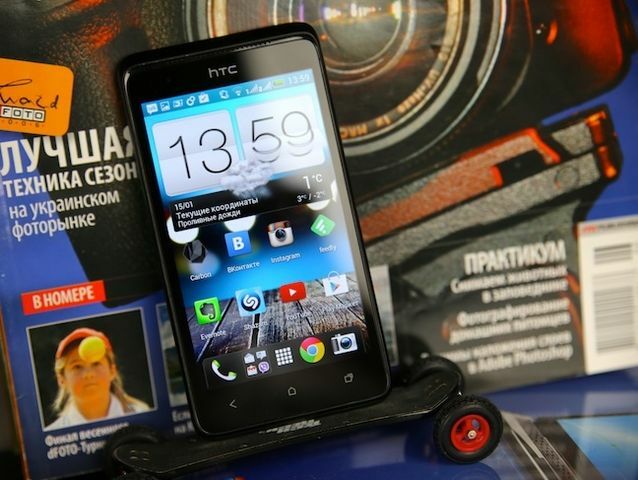 All as the old dvuhsimnikov HTC. Someone like this, someone – no. Sneaking suspicion that the updates will not be. Lovers to be up-to-date, this situation clearly does not like it. But the target audience dvuhsimnikov often this question do not care. Works – and this is important. And it runs stably without spontaneous reboots and flown applications. Let not giperbystro, but no surprises. With excess heat I have not encountered. During browsing, watching videos and games body warm, but no more. Another important criterion for the smartphone will be autonomy. 1800 mAh battery should operate for an active day, anyway, I had enough and more. Given that serious games difficult to play here, the battery will not be exhausted once again, which will stay connected longer. Overall, great autonomy in the test battery AnTuTu accumulated 600 parrots. And people who often go on long trips, like the battery is removable. Let no front camera, let body creaks a bit, but there should be two dvuhsimnike radiomodule! 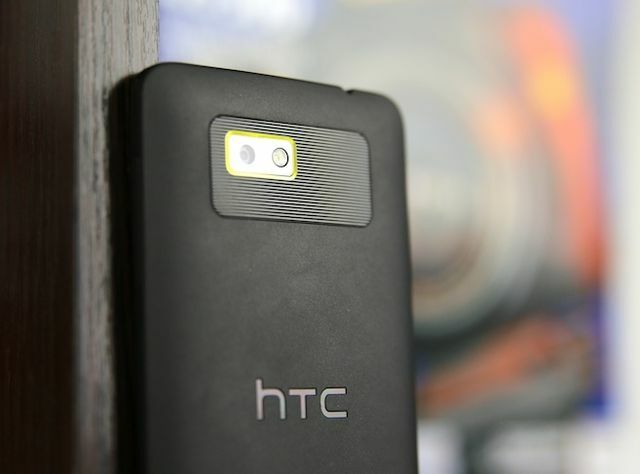 “Yes” – said the HTC gash and two radio module 400 in Desire. Accordingly, all the work FAQ Sim-cards disappear. While you are speaking with a single operator, and other calls will be from the second break. 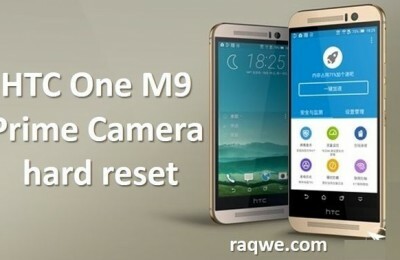 And the organization of the two Sim-card is no different from the old (see previous) models with HTC Sense 4. As before, two buttons for operator calls and messages. Settings are standard and are in their usual place. In a nutshell – is nothing new. Dimensions: 131,8 x 66,9 x 9,9 mm. Operating System: Android 4.1.1, JB. Processor: Dual, NovaThor U8500, 1 GHz. Display: Super LCD2, 4,3 “, 800 x 480, 216 ppi. Memory: 4 GB flash + Micro SD. 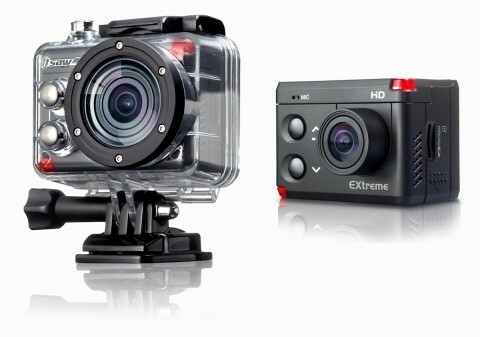 Camera: Basic – 5 MP, video recording of 1280 x 720. Wireless technologies: WiFi, Bluetooth 4.0. Please mocked. Secure the rear cover scrapie … Constantly. No front-facing camera, and the main old and without outstanding opportunities for today. Outdated both in terms of OS, and visual design. In demanding games to play from the comfort will not work because the old processor. But! The smartphone good design, perfectly matched body materials, normal autonomy, two radio module, a wonderful display and class dynamics. Conclusion – the smartphone is definitely not for the boom. But for a person who is important to have a reliable device, Desire 400 must be worthy of the decision. It is worth to consider the price – $ 260. That’s a third of the price of HTC One Dual Sim and $ 100 more than the older model cheaper Desire 600. Honestly, for dvuhsimnika Desire 400 is a great solution. About this should be an inexpensive smartphone for a person who is not trying to replace all single device. People in need in a very advanced (in all sense) smartphones, this, of course, no interest. If I needed a simple dvuhsimnike with an acceptable cost, I would definitely drew attention to Desire 400. Anyway, I liked it more than his closest competitors. Previous PostTeaser coming Fujifilm X-T1 and a little investigation on the picture Next PostReview Sony Cyber-Shot QX10. Lens-camera, camera lens or a device for mobile photography?